Moreover, you can adapt this EA to your preferred trading style, for instance scalping trading style, by optimizing the TP, SL, etc to your taste. EU_Savings_Box has Trading Time Filter which makes it possible to limit trading to specified period of the day. This option can be optimized with your broker's time and data for better performance. MM can be increased or reduced appropriately. Higher value mean higher stake, higher profit. Lower MM is recommended for Bigger Investment. This EA with its default setting is optimized and recommended for H1 Timeframe of EURUSD Pair and has been backtested with good performance and low drawdown for 8 years on real tick data. 3. MM_Percent: Money Management - Default value MM 15 or below is recommended. Higher value means higher stake. 15. AllowTradingFromHour: 0 to 23 can be used. 16. AllowTradingFromMinute: 0 to 59 can be used. 17. AllowTradingUntilHour: 0 to 23 can be used. 18. AllowTradingUntilMinute: 0 to 59 can be used. EA will recognize currency pair prefix, suffix, as well as broker's digits. Hence it can work well with any MT4 broker and can manage both small and large capital. More expert parameters are added to enable user optimize and customize expert as desired. More trade protection options are also added. Default parameters are now optimized. More expert parameters are added to enable user optimize and customize expert as desired. More trade protection options are also added. Important corrections have been made in the expert comments and input. Issue with maximum lots, minimum lots and lots steps are now resolved. Backtest is now improved. 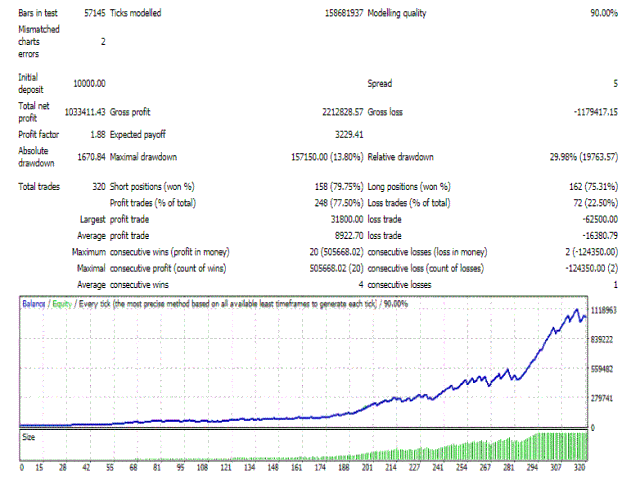 For traders who prefer trading with a fixed lot size, this version is the solution. Now you can choose to use a fixed lot or use a dynamic growing lot.